In large bowl, mix filling ingredients. Pour into crust-lined pie plate. Bake 15 minutes. Reduce oven temperature to 350°F. Bake 25 minutes longer. Meanwhile (during last 5 minutes of bake time), in 1-quart saucepan, mix brown sugar, corn syrup and butter. Heat to boiling over low heat. Reduce heat; simmer 2 minutes. Remove from heat; stir in vanilla. 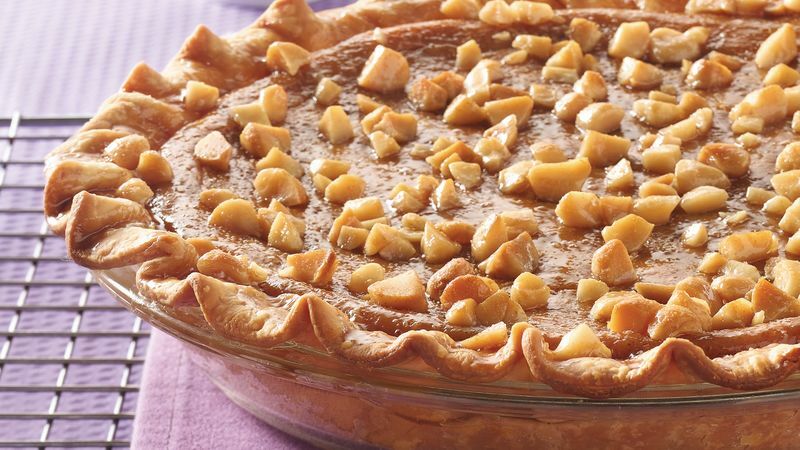 Sprinkle nuts evenly over pie; drizzle with topping mixture. Bake 20 to 30 minutes longer or until knife inserted in center comes out clean. (Place foil or cookie sheet on lowest oven rack during baking to guard against spillage.) Cover crust edge with strips of foil during last 10 minutes of baking to prevent excessive browning. Cool 1 hour. Garnish with crème fraîche. Cover and refrigerate any remaining pie. Try unsalted cashews or peanuts as a substitute for the macadamia nuts.